Periodontal disease is a chronic inflammatory disease cause by bacteria found in plaque. As the bacteria spread below the gumline, the gums and bone around the teeth break down, forming pockets that can lead to loose teeth. 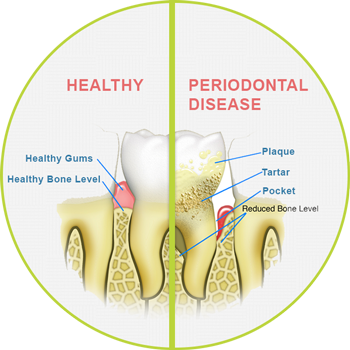 Periodontal disease is the #1 cause of adult tooth loss. Half of American adults aged 30 and over have periodontal disease. That's 64.7 million adults affected. Is your diet low in important nutrients? Are you taking any medicines, such as antidepressants, heart medications, or birth-control pills? Do any family members have the disease? Are your gums pulling away from your teeth and receding? Have your noticed a change in the way your teeth fit together? Do you have loose teeth or have you recently lost any teeth? If you answered YES to ANY of these questions, you may be at risk for periodontal disease. I have Periodontal Disease. Now What? 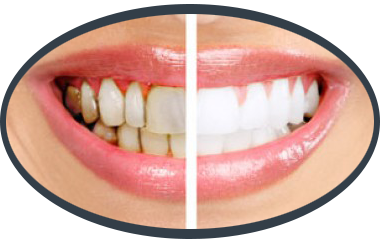 We want your teeth and gums to be as healthy as possible. 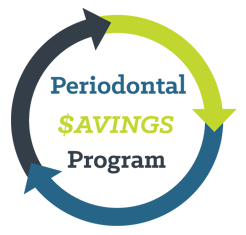 That's why we developed our Periodontal Savings Program! Scroll down the page to learn more!